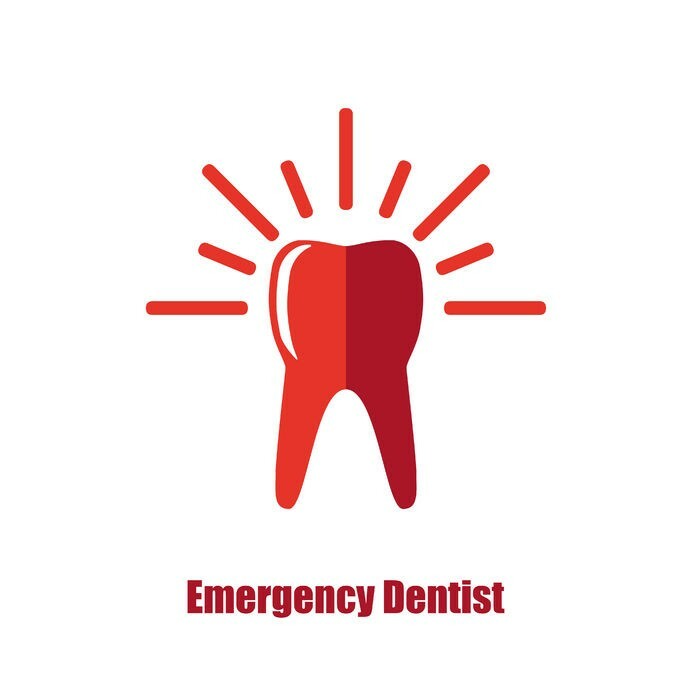 A dental emergency can be any number of instances that require the patient to call or go into the dentist office immediately. Dr. Michael considers a true dental emergency pain caused by the tooth, jaw or surrounding gums or cheeks. He also considers a missing, broken or lost tooth in the smile an emergency. Although Dr. Michael and patients agree that both are dental emergencies, it is important to clarify that some dental emergencies may be life threatening. In the case that you are experiencing swelling,difficulty breathing, or you feel you life is danger, call 911. See below for some other examples of dental emergencies. In each case it is best that you contact your dentist (or Sarasota Dentistry) if in Sarasota, FL. You will get an appointment immediately and Dr. Michael will diagnose and treat the dental emergency appropriately. For a knocked out tooth, rinse the tooth completely and try to set the tooth back into place. If the tooth will not set, try biting gently on a wet paper towel or tea bag. If the tooth still will not set keep it wet by placing it underneath your tongue or in a container of milk. If you have cracked or broken a tooth, rinse the tooth with warm water and apply a cold press to the area to reduce swelling. If a tooth was cracked or broken and is cutting the tongue or inner cheek, rinse the cut area with warm water then place a damp paper towel or gauze over the tooth to continue from cutting the area any further. Some examples of other common dental emergencies are fillings and crowns that dislodge and fall out of place. If your fillings and crowns have fallen out of place or become dislodged, call your dentist right away to get the filling or crown replaced. While you’re waiting for the replacement refrain from chewing or placing any sugars/food over the area. An abscessed tooth also requires emergency dental care, depending on the severity and pain that persist. What is an Abscessed tooth? An abscessed tooth is an infection of the middle of the tooth that spreads to the root and exiting the bottom of the root into the jaw bone. Abscessed teeth occur when tooth decay and cavities go untreated and reach the chamber of the tooth. They may also be caused from previous trauma to the tooth, a crack in the tooth or a virus that attacks the nerve of the tooth. The first signs of an abscessed tooth are a toothache and pain when biting down or chewing. Swelling of the jaw, and excessive toothache throbbing are also symptoms. Once an abscessed tooth has released the infection through the bottom of the root it is common for the surrounding gum area to sprout hard inflamed blisters that will accumulate and release puss. 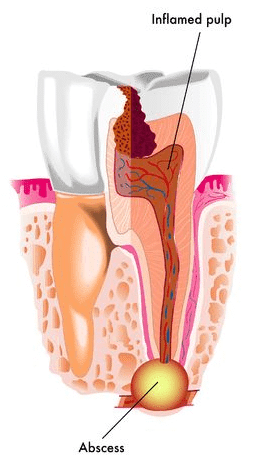 A dentist can bore out the decay and flush the root with a root canal treatment which will rid the area of the abscess. Although the issues above are dental emergencies, there are other dental complications such as a chipped tooth, a minor toothache, and food or objects stuck in-between the teeth or gums. These can lead to dental emergencies, but it is best to first call your dentist and get an examination to determine the appropriate treatment. Dr. Michael may or may not treat your condition at the exam, it depends on what treatment is necessary. A chipped tooth can cause cuts within the mouth creating excessive bleeding, but if no cutting is occurring then an appointment can be made. A minor toothache could potentially be the first signs of something bigger, its best to call the dentist for an examination to determine if the ache is something to be concerned about. Some self-remedies such as using Sensodyne tooth paste for a couple of weeks can be tried prior to making the call. That is not generally recommended because if the ache is coming from a cracked tooth, waiting may increase the chance of losing the tooth. For food stuck in the gum or in-between teeth, try gently flossing the stuck food and do not use any sharp or pointy. If the food is still stuck, call your dentist for help and find out if there is a different solution or a dental visit is needed. For any dental emergencies, call Sarasota Dentistry at 941.929.7645. Dr. Michael will make every effort to get you out of pain as soon as possible.